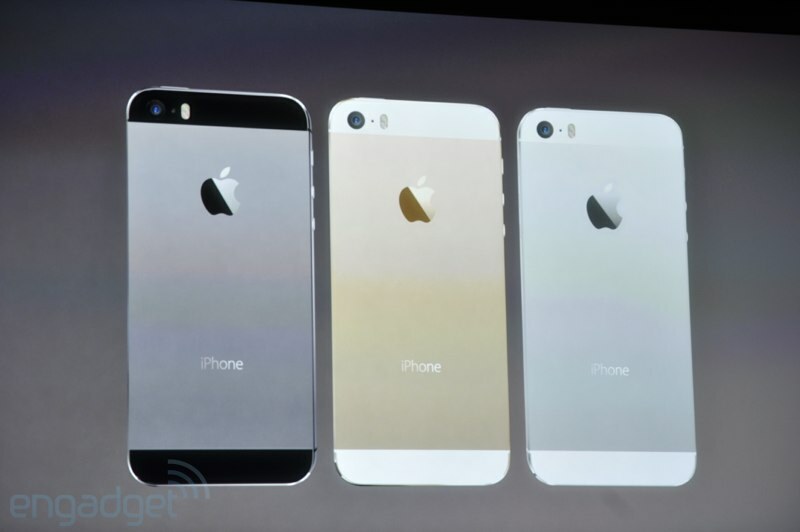 As expected, Apple has unveiled two new iPhones today, the iPhone 5S and iPhone 5C. The widely-leaked phones speak to two different markets, with the more expensive 5S maintaining the same premium build, internal specs and price as the former iPhone 5, while the 5C enters the market as a so-called lower-cost variant. First, the iPhone 5C. It will be available in green, yellow, blue, white and red. Apple claims that there are no seams or joints in the device — it is made with a single piece of “hard-coated” polycarbonate. It has a 4-inch display with the same 1136×640 pixel resolution as the iPhone 5. It also has the same A6 chip and 1GB of RAM of the iPhone 5. There’s a new HD FaceTime camera on the front and an 8MP iSight camera on the back with BSI, IR filter and 5-element lens. Looks to be the same one as the iPhone 5, too. It will also have full LTE connectivity and dual-band WiFi along with Bluetooth 4.0. 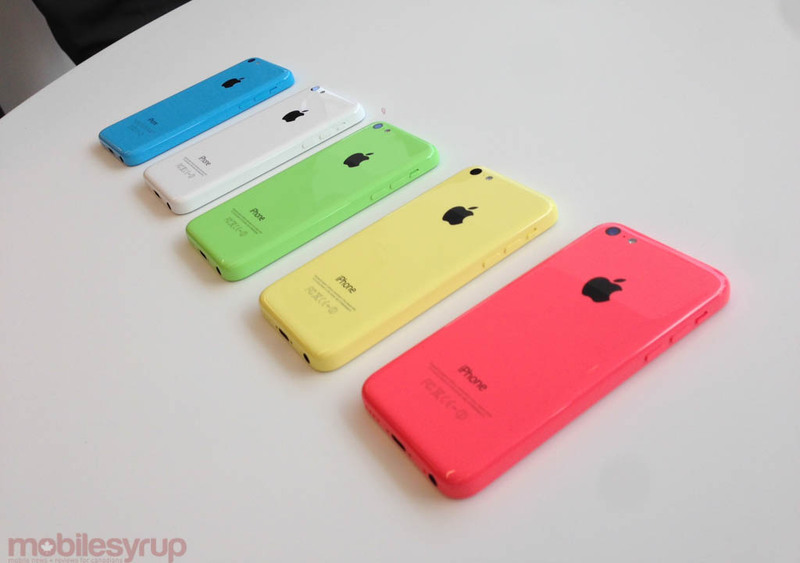 The 16GB iPhone 5C will be $99 on a 2-year contract, while the 32GB will be $199 (all prices in USD). The second phone on the docket today is the iPhone 5S. The iPhone 5S has a 4-inch 1136×640 pixel IPS display, identical in size and resolution to the current iPhone 5. What’s different is tantamount to the typical evolution of an iPhone: a faster processor, improved camera, colour additions and, yes, a fingerprint scanner. According to Apple, it’s the “most forward-thinking phone we’ve ever created.” It comes in a new gold colour, in addition to the existing white and slate. Probably the most important improvement is the A7 chip, a 64-bit SoC that’s “the first ever of its kind in a smartphone.” It has over one billion transistors and a modern instruction set — this is truly a computer, just shrunk to a 102mm squared die size. While apps will have to be re-engineered to support the new instruction sets, it opens up a number of possibilities for mobile computing (can’t wait to see what the A7X is capable of in the new iPad this fall). To the layman, it means that the A7 CPU and GPU are twice as fast as the iPhone 5’s A6. The new GPU supports OpenGL 3.0, which is one of the newest programming frameworks for 3D games (which also came recently to Android 4.3). 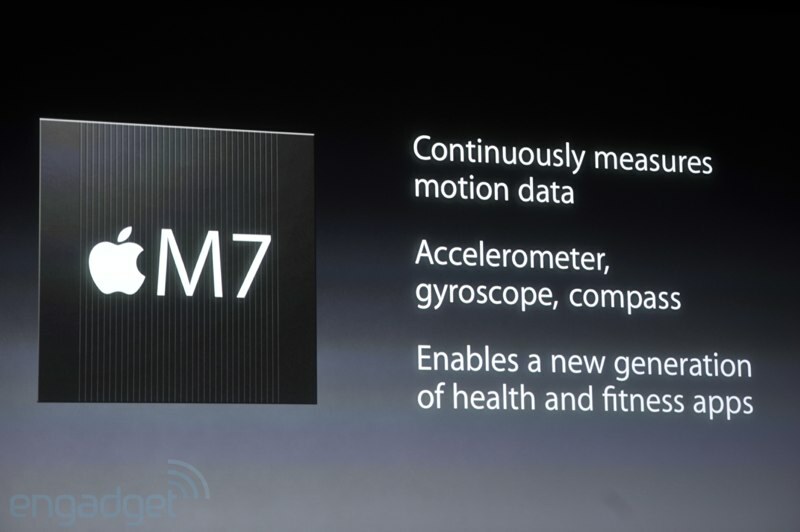 There’s also something called the M7, a chip that works alongside the A7 to measure motion data, accelerometer, gyroscope and compass. It works with the newest generation of health and fitness apps such as Nike+ Move, to track all of your movement. This works instead of a Fitbit. The iPhone 5S promises 10 hours of battery life from LTE browsing and 3G talk time, along with 40 hours of music playback and a staggering 250 hours of standby. Similar to last year’s model. The new camera is also improved over the former model, with a wider f/2.2 aperture and bigger pixels despite the 8MP resolution. This lets in more light — a 15% larger active sensor area — which automatically makes better photos from the same lighting scenarios. There’s also a digital form of image stabilization, and a new burst mode at up to 10fps. The software analyzes multi-photo series and chooses the best one. This is similar to Best Shot from the HTC One and Galaxy S4. To make low-light photos better, there’s an update two-colour flash that purports to be less overwhelming and warmer on the skin. It also works together to create more uniform colours, with up to 1,000 variations in intensity. The camera support 120fps slow motion (slo-mo) as well at 720p, and the built-in editor can speed up or slow down certain parts of the video for a great effect. Perhaps the most important addition to the device is a digital fingerprint scanner. That ring around the mechanical home button indicates when it’s being used. Called Touch ID, “it reads your fingerprint at an entirely new level,” with 500ppi resolution and 360 degree readability. 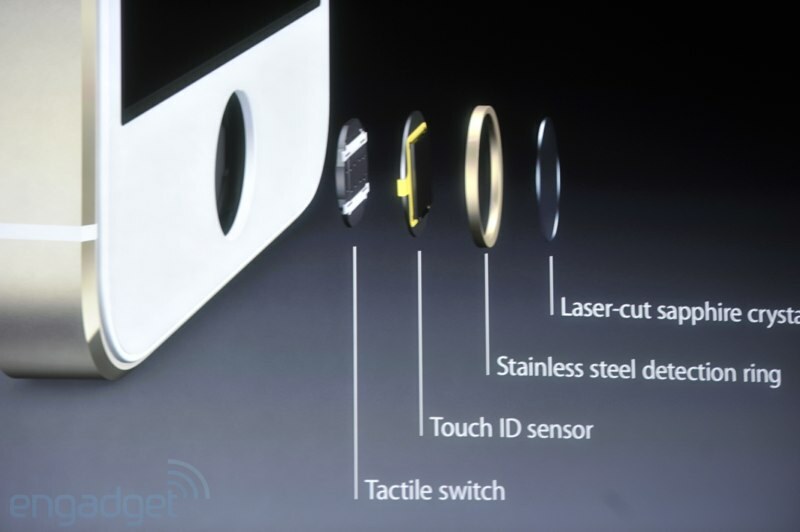 The use cases are many, and Apple says Touch ID has been deeply integrated into iOS 7. It allows you to authenticate purchases using just a slight depression of the home button. There is a sapphire crystal lens that takes a photo of a user’s fingerprint and analyzes it for consistency. In Apple tradition, Touch ID can be used by multiple people, and sensitive information is not stored on Apple’s servers at all. All data is encrypted, too. The iPhone 5S maintains the same price points (at least in the US) as before: 16GB for $199, 32GB for $299 and 64GB for $399 on a 2-year contract. Expect similar pricing in Canada. 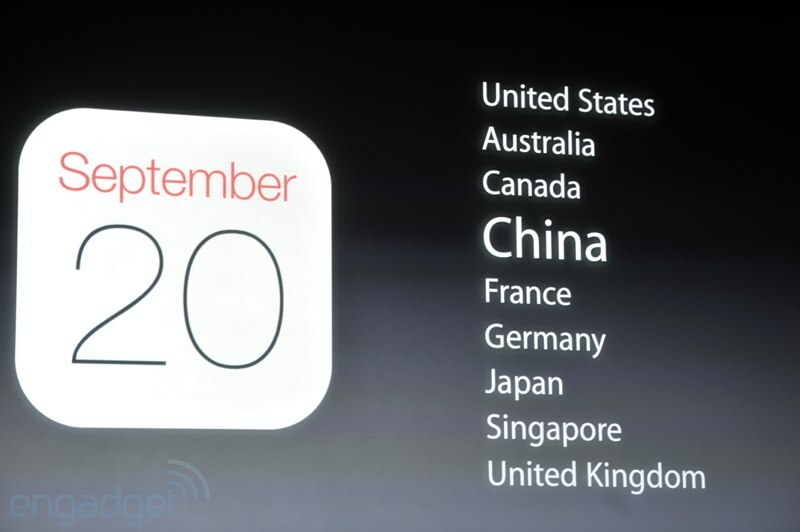 It will be available in Canada on September 20th, with pre-orders beginning this Friday, September 13th. This article is still under construction. Please check back in a few minutes for updates. Images taken from the Engadget livestream.